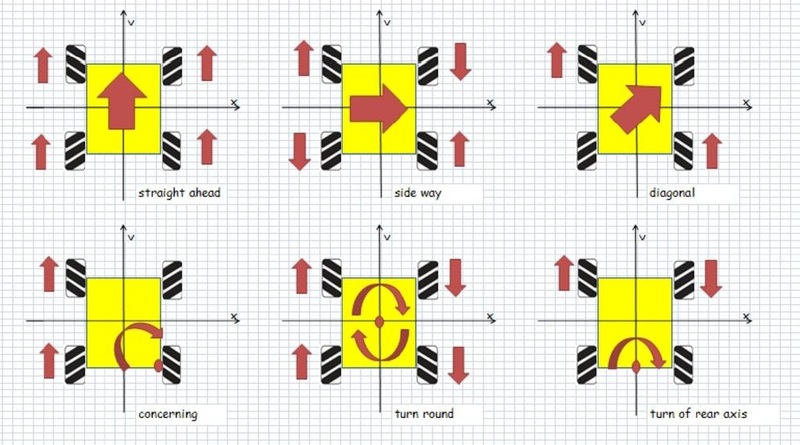 Mecanum drive is a type of holonomic drive base; meaning that it applies the force of the wheel at a 45° angle to the robot instead of on one of its axes. 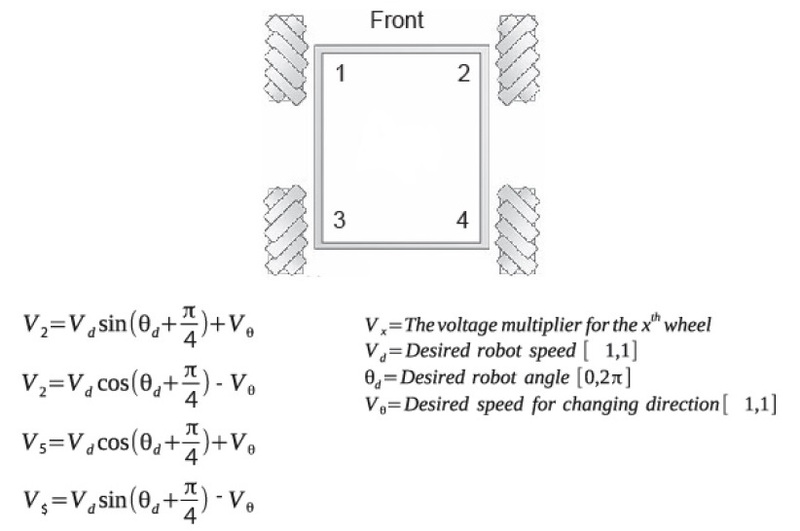 By applying the force at an angle to the robot, you can vary the magnitude of the force vectors to gain translational control of the robot; In plain English, the robot can move in any direction while keeping the front of the robot in a constant compass direction. 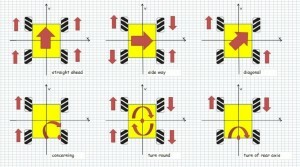 The figure below shows the motions that can be achieved for various combination of wheel rotation. 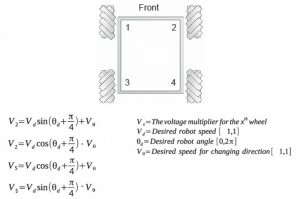 Using that information the voltage multipliers for each wheel (numbers shown in Figure) can be calculated using the formulas found in the following Equations. This architecture and script was successfully tested on a small mecanum platform using two dual-channel SDC2130 controllers. 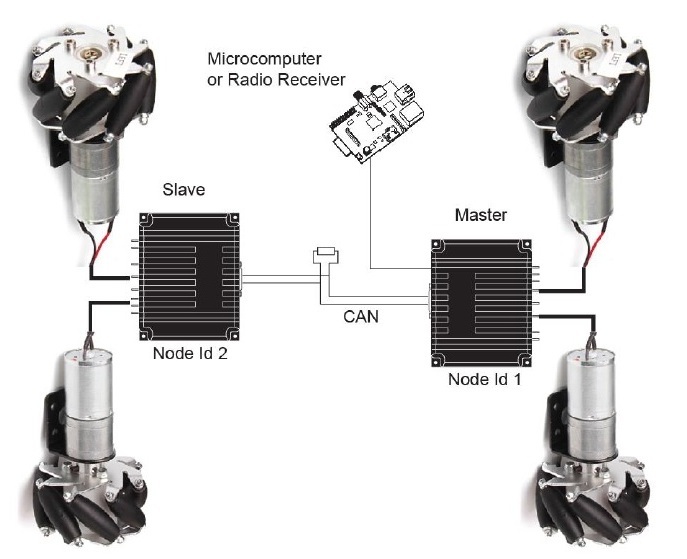 The motors were not equipped with encoders and where therefore operated in open loop. The robot responded to commands from a RC radio using a miniature Spektrum receiver. 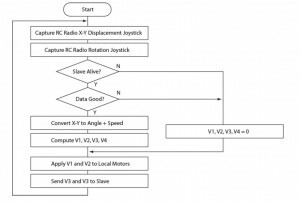 As expected, the robot can indeed be moved in all directions and orientations in a very intuitive manner with just an X-Y joystick to control de displacement direction and speed, and a second joystick to control the rotation. This demonstrator can be scaled practically without modification to very large chassis capable of carrying heavy loads, and/or moving at higher speed. Only larger motors and controllers would be needed. Operating in closed loop will bring added precision to the motion. ‘ Script is written for use in SDC2130 but will work on any other model by changing where commented. 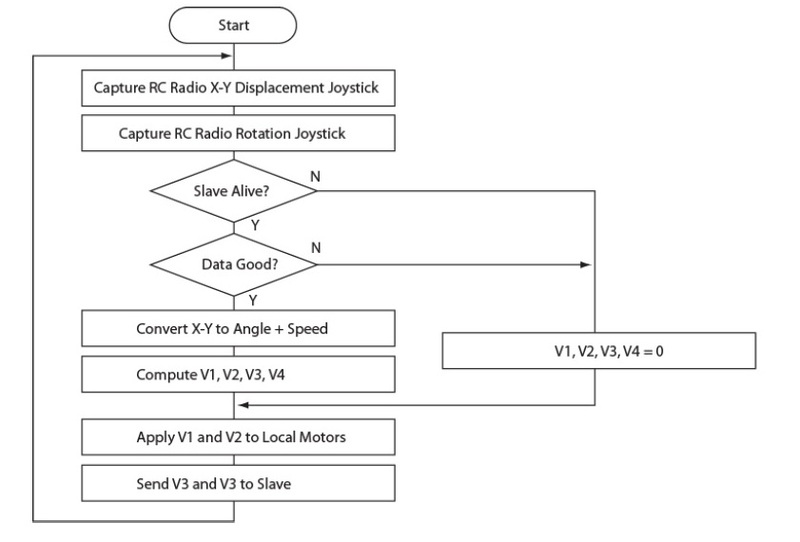 ‘ Script must be loaded and executed in controller that will serve as Master on a RoboCAN network. ‘ Script is provided for demonstration purposes, as-is without warranty. ‘ Code below is for use on SDC21300 with Specktrum Radio enabled.